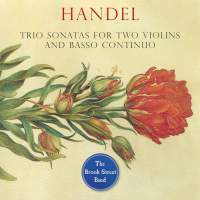 Having made enjoyable recordings of the Op 2 (c1731) and Op 5 (1739) collections of trio sonatas, it makes perfect sense for The Brook Street Band to complete the job by recording the three additional trio sonatas by Handel that are certifiably authentic but which were not published during his lifetime. The quartet of Rachel Harris and Farran Scott (violins), Tatty Theo (cello) and Carolyn Gibley (harpsichord) play with sensual directness and a vividly attuned awareness of harmonic contours in the early F major Sonata (HWV392), which might have been written either in Hamburg in about 1706 or in Italy soon afterwards; the sudden interruption into dramatically expressive descending chromatic dissonances at the end of the second movement is dramatically weighted, and the convivial final Allegro is performed with the ideal juxtaposition of crispness and fulsome sonorities. The Sonata in C minor (HWV386a) was probably written in about 1717‑19 while Handel was a guest of the Earl of Carnarvon at Cannons, and the sublime Andante is a sweet reworking of an aria that appears in several of his Italian-period works (notably Ottone’s ‘Vaghe fonti’ in Agrippina). Best of all is the large-scale Sonata in C major (HWV403), which dates from around the same time as the musical material’s appearance in the oratorio Saul (1739). Despite being one of Handel’s best chamber compositions, this gets somewhat ignored by recording artists so it is pleasing to hear The Brook Street Band’s shapely account; the autograph manuscript is in the Fitzwilliam Museum, so I’m puzzled that Tatty Theo’s booklet-note says that there are no autographs of any of the pieces on this recording. Moreover, the note overstates its advocacy of the undoubtedly spurious Sonata in E major (HWV394) and the contested Sonata in G minor (HWV393) – but there is nothing to quibble over in The Brook Street Band’s masterly performances.